I had an interesting experience this summer watching the musical Fiddler on the Roof. Produced by one of our local community theatre groups, I had been following the rehearsal process with interest and was looking forward to finally seeing the show after hearing great reviews from friends. Now, you should know that I’m Jewish and that I live in a small city where most people aren’t at all familiar with Judaism; for this Northern town, Jewish is exotic. The show was very well done; beautifully staged and directed. The performers were committed and deeply in role. They were physically present and their characters were wonderfully embodied. It was a great night of theatre. But I had a strange reaction to the play, one I hadn’t expected. At points during the evening, I felt very uncomfortable. It was unsettling to watch actors pretending to light Shabbat candles and bless bread and wine as an act of entertainment. These are rituals that I perform every week as part of our Shabbat meal either at home or at synagogue. To see them on stage was very odd. Later on in the play when Tevye’s third daughter, Chava, marries the non-Jewish Fyedka, the actor playing Tevye inserted the mourner’s kaddish prayer into the script, to make the point that Tevye now views his daughter as dead. Again, I had that ticklish feeling of discomfort. Here’s a very solemn prayer that we only say when we have a prayer quorum or minyan of 10 adult Jews (or 10 men, depending on your branch of Judaism) and there it was being performed on stage. I found myself reflexively muttering “amein” under my breath at the appropriate moments. My final moment of discomfort came during the scene when the soldiers arrive to advise the residents of Anatevka that they have to leave. Behind me, a woman whispered “it’s the Germans.” “No!”, I wanted to shout back… “It’s the Russians!” Having that historical inaccuracy hang in the air, uncorrected, really bothered me. It itched at me the whole way home. Altogether, it was a revealing experience; this is what it’s like to have your culture on display, represented as entertainment… appropriated, to some extent. Now, I’m not suggesting we halt all productions of Fiddler on the Roof. It’s a great play; if I were a rich woman I’d see it again. But I think it was a really good experience for me to go through that discomfort. In the community where I teach, we are confronted daily with the legacy of First Nations residential schools. We are struggling as a system to find ways to reach out to First Nations communities, to repair the damage that years of at best assimilationist and at worst genocidal policies has created. One piece of that effort has been to ensure that there are opportunities for First Nations students attending our schools to have the opportunity to study their language and culture while at the same time building some cultural literacy among the non-native students too. Sometimes, this work involves having First Nations teachers and elders presenting cultural teachings to classes, to familiarize all students with First Nations cultural beliefs and practices. Last week, I was asked to come into a class to follow-up a cultural teaching with an arts-based activity. Now, as far as I know, I have no First Nations heritage. My children have Haudenosaunee heritage but, alas, not from me. So it’s awkward, to say the least, to be in the position of having to support teachings that I’m not that familiar with and which don’t belong to me. It’s additionally loaded with meaning because of the many ways that First Nations Art has been appropriated by the mainstream culture over the last several hundred years, including some particularly egregious examples in the past few years. The optics of a white lady standing in front of a class “teaching” First Nations Art… it’s not good. But there I was, trying to figure out a way to compliment a cultural teaching on the subject of long hair through a Visual Arts activity that wouldn’t just devolve into cultural theft. I wanted to share with you what I came up with, not because I consider it some kind of authoritative solution to what will remain a challenge, but both because I think the wrestling itself is a meaningful process and because I think it’s important to share our discomfort and to respectfully ask for guidance. One of the things I have taken away from my years in Kindergarten is a healthy respect for materials, guided by the practice in Reggio Emilia of establishing material-rich ateliers in schools. I’ve been trying to position myself as an atelierista, a provider of materials, of techniques, of curation, but not an instructor with any particular end in mind. So for a teaching about long hair (here are two videos if you want to learn more), I decided to work on the ideas of personal identity and expression of belonging that seemed central to the teaching while working with textiles, to link to the idea of hair. 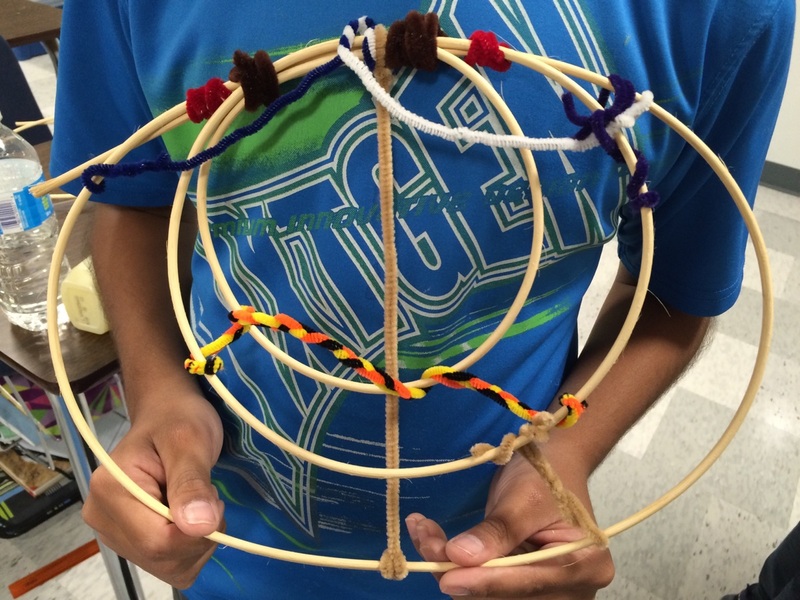 I taught the students how to braid, presented the materials (beads, thread, pipe cleaners, and wicker) and off they went. They produced amazing work that had symbolic meaning for them, using the cultural teaching as inspiration. A perfect solution? Likely no, but maybe a step forward. I will never forget the feeling of discomfort I experienced sitting in that darkened theatre watching Fiddler on the Roof. I hope it remains fresh because it’s helping me to approach this aspect of my job with a greater sense of understanding and compassion. I think it’s making me a better teacher.